The Book-Stool is made by me, Charlie Walsh. It says a lot about my journey through life. I lived my first thirty-five years in Honolulu. As a kid, I explored the valley and mountains near my home. There the stories of Old Hawaii came to life in my imagination. The love of those legends steered me to my first career in theatre. I was the set designer (and carpenter) for a children’s theatre. I loved designing clever, beautiful spaces for actors to move easily through and that had kids “oohhing and aahhing” when the lights came up - transporting them to a new world of my imagining. Later I moved to Washington State and became an elementary school teacher. Teaching kids about great books and stories became my creative outlet for nearly two decades. During our summer breaks, I satisfied my designing and building fix by working on a small home for my wife and me on a tiny saltwater cove in southern Puget Sound. When that was finished, I moved on to building furniture for our home. About the time the house was full of furniture, I took a leave from teaching. It was time for the next chapter in my life adventure. 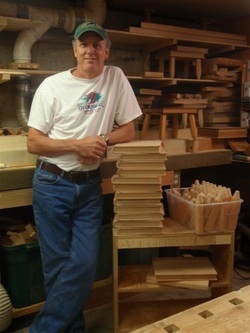 The idea for the Book-Stool came about through my love of design, teaching, and woodworking. I wanted it to be well made and functional, but also something that both kids and adults would enjoy; a stool that becomes part of the living space and a conversation piece, perhaps. A book, with a title, that would encourage parents to tell stories to their children, as my daughter loved to hear stories about herself. It is my hope that kids take their Book-Stools through adulthood and that the stories stay with them forever. A good day for me is being in my shop making book-and-pencil products or designing my next project. Sometimes, you might find my wife and me kayaking on Puget Sound, gardening, watching a Seattle Sounders soccer match, or reading a good book.